Grizzly #399 and cubs, Grand Teton National Park. In Yellowstone and Grand Teton Park by law you must remain 100 yards from grizzlies and wolves. 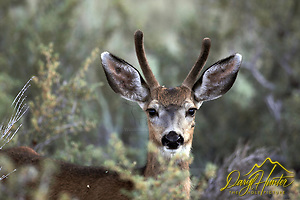 Mule Deer buck checking me out, he is accessing whether to take flight of fight. Before photographing wildlife it is of paramount importance to learn about their behavior first. All large animals can be dangerous. In the book “Death In Yellowstone” the book points out that in the history of Yellowstone 105 people have been killed by wildlife, five by bears and 100 by bison, elk and moose. Many visitors assume that because many of Yellowstone’s animals are habituated to humans that they are not dangerous but nothing could be farther from the truth. All animals have something called a “Fight Or Flight Distance” essentially their fight of flight distance is what we know as a ”comfort zone”. As animals watch you approach they are assessing their comfort zone and what to do if you cross into it. 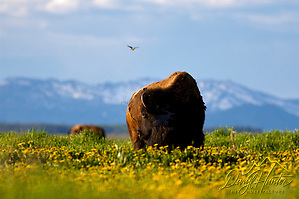 Bison have a very short fight or flight distance because of their immense size they are very secure animals. That said, the shorter the fight or flight distance the more likely they will fight. This is why Bison are the most dangerous animal in the Greater Yellowstone. As you approach and you look into their big pretty brown eyes as the stand there and stare at you with those big old Bessie eyes they are pondering: Should I run, or should I kill them, should I run, or should I kill them. More often than not they will run but that isn’t always the case. Because bison seem lethargic like a cow in a field people feel as though they can approach them, the same folks that would be afraid to approach a cow in the field. 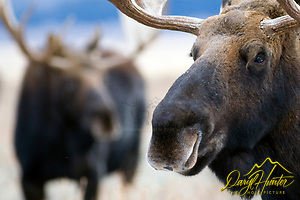 Moose look like Bullwinkle our favorite cartoon character so they think they can approach them – don’t do it. In Alaska more people are killed my moose than by bears. Moose like the bison are large and have a short fight or flight distance. When I was photographing these two they were quite a distance away but approached until quite close at which time I moved to the security of my car. While in the field looking for critters like elk and bighorn sheep upon finding them I will watch for a bit then place myself in the direction in which they are moving. If I just stay stationary and watch where they can see me they make the judgment of what their fight of flight distance will be as comfort zones can be different distances depending upon the circumstances. Many times as a grazing animal works its way towards me they will look up often and access the situation and if they feel comfortable the comfort zone they establish can be quite close. Had I tired to approach them the fight of flight distance would have been much greater. I have seen grizzlies with cubs approach this way, cautious, attentive and constantly accessing their fight of flight distance. One day while photographing a nice bull elk beside the Gibbon River that had gained my trust and had moved quite close, someone driving by hurriedly stopped and shouted to the wife, come on honey grab junior, I found a tame one and he hurried and got between me and the elk much to the elk’s chagrin who had started snorting and pawing the ground, I jumped up and moved the wife and kid into a safe spot then turned around to watch a survival of the fittest event. The visitor’s history of Yellowstone is fraught with anecdotes like the one above, many resulting in death. Yellowstone is a great place to find habituated animals that make great photographs but don’t get killed trying to get them. Posted on Wednesday, March 28th, 2012 at 6:37 am. Filed under: Photography, Photograpy Tags: Bison, buffalo, fight or flight, grizzly bear, moose, photography, safe distance, safety, wildlife behavior, wildlife photography, wolf, Yellowstone Wildlife	RSS 2.0 feed.